Okay, raise your hands if your kid scores badly for Chinese. *sigh* we are in your shoes too. Chinese is not DinoBoy's strong subject, when he failed the subject in Primary 2 we thought he would have put in more effort to work on the subject but apparently the effort is not enough. His score averagely 60 marks through the years. A 2nd bomb dropped onto his lap when he failed the subject by 2 marks earlier this year in CA1. I almost passed out and disowned him! When I laid my hands on Paper 2, my heart stopped a second time.. he scored 7 out of 22 marks in comprehension. How in the world does someone score that kind of marks??? I realized that we have to do something about it otherwise the consequences will be disastrous! 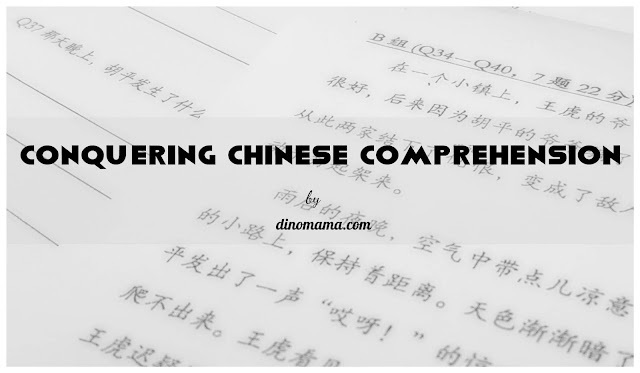 We attended the PSLE Chinese workshop earlier this year; you can read about it here, I decided to put the tips we learned on that day to good use. And I am happy to share that DinoBoy scored better on his school's Chinese practice papers and passed SA1, not in flying colors but with a good grade. I am heartened to see that he scored more marks in his comprehension, one of his weakest section and pulling down his overall marks. I am sharing the tips I learned with you, hope it will help your child fare better in comprehension. When tackling comprehension I am sure the students know the drill very well but not many of them do it even though it has proven that those who did score higher marks than them. 1. Read the passage carefully, preferably at least 2 times during this stage. Most of us do not like to do this because we think we understand the passage with just one reading. Well, that is true but for comprehension we are reading the passage with a purpose. 2nd time reading - identify the 4W; Why Where When What of the passage or each paragraph. 2. 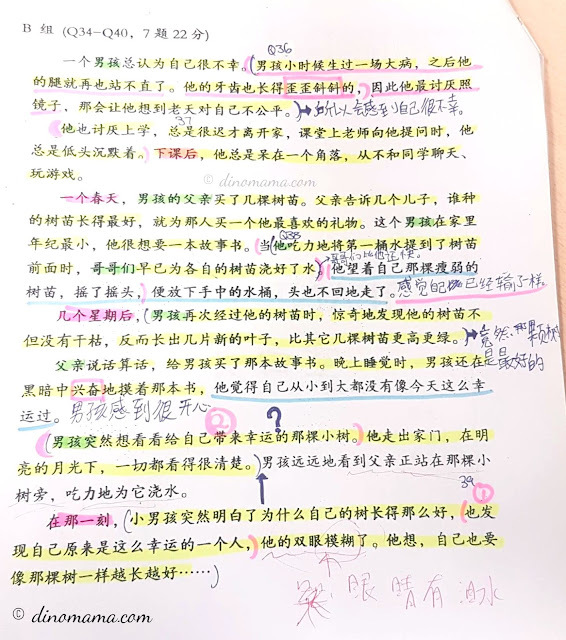 Regardless of the comprehension passage story line, there is only ONE main theme or topic, once you have identify that answering the questions will be easy. Here are some of the theme/topic as shared by the trainer (my English translation may not be exact but the meaning is still about the same). 1. Read the questions at least 2 times, yes even for the questions. 1st time reading - understanding the question being asked. 2nd time reading - highlight important information such as "question. 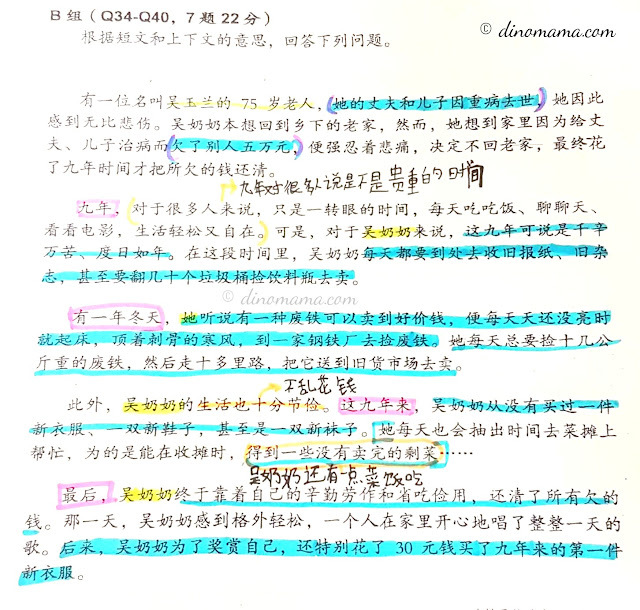 type", "character" and "keywords/sentences" either with different colored highlighters or by drawing lines, squares or circles. Use this method while reading comprehension passages and questions. See example below where circled words are "question type", underlined words are "character" and squared words are "keywords/sentences". 2. Read the passage; this would be your 3rd time reading it, to have a rough idea where are the answers. 3. Identify the answers by highlighting or underlining it with a different colored pen and indicate question number beside it. Here are 2 example of DinoBoy's work on the comprehension passage. He uses different colors to represent different important information every time, depending on his mood at that moment. If you make it a habit to do all the above, you are already half way to success in conquering comprehension. Next, it is the answering part that will determine whether you succeed or failed miserably. Frankly, it is not difficult to answer and score comprehension but students find it challenging because most of them are not strong in this language thus they have problems understanding the passage or unable to form logical answers with grammatically error free sentences. Well, I have a good news for you, unlike English comprehension, students are allowed to lift the whole sentence or paragraph when answering Chinese comprehension questions. That makes scoring so much easier! Having said that, you must also ensure that you have written ALL the answers to get the marks. How to be sure that you have given all the answers? A good gauge would be by looking at the marks allocated for each question. The rule of thumb is for a 2 marks question you have to give 2 VALID points/reasons as answers, a 4 marks questions may required AT LEAST 4 points. Now the keyword to the above bold sentence is VALID, this means the answer will have the key points, no marks will be given if unnecessary points are given. Kids are taught by their teachers to find answers by looking at similar words that appeared in both the passage and question, this may probably help you in getting the answer but they have to understand the context of the passage to pluck out the correct answers. Do bear in mind that sometimes answers for a question can be found in different paragraphs, the reading & highlighting you have done during the earlier stage would have enabled you to identify all the answers. Read the passage again; 4th time reading the passage, to be sure that you have highlighted all the answers. If answers for a particular question are all over the passage, it will make things easier to indicate question number with an extension, e.g Q38.1, Q38.2. Once you have written that sentence in the answer put a tick against it so that you know you did not miss out anything. Now that you have highlighted all the answers, it is time to organise them and present them in a correct and orderly way to get those marks! Since we are able to lift the whole sentence off the passage, half the remaining battle is won so try not to use your own words to reconstruct the sentence. Also check you answer after you have written to ensure the answers are there, sentence construction makes sense etc. Here's how to tackle a few common questions that earn u full marks if you answer them correctly. During my time I was taught to answer question in full, such as the 1st part of the following question "我认为礼貌在我的生活里很重要。" instead of just answering "重要。" but DinoBoy told me that his teachers told them it is fine to just answer the latter, on the other hand I also hear from friends that their kid's school do not accept that. Therefore, I strongly suggest writing a full answer, it doesn't cost much to write those extra words but it will cost us precious marks if we just write the one or two word answer. One of the frequently seen comprehension question is to ask the kids to give their life experience in relation to part 1 of the question; as seen in the above and following questions. Most of the kids are stumped when they encounter such question because they are not exposed to enough life situations (let's face it, we pamper and bubble wrap them too much) to give example. I tell DinoBoy that even if he did not experience the situation just make up some stories, if it sound logic or morally correct he should score some marks. Again, use the marks allocated to gauge the length of answers, take a look at DinoBoy's answer to have an idea on answering the question. An important thing to remember while answering 2 parts questions is that both parts must correspond to each other. Sometimes the students are asked the "Before-After" question, such as the one below. This type of question indicates that a major event happened that caused someone's behaviour/opinion/action or a situation to change drastically. Identify the "before" and "after" events in the passage, do take note that the answer will usually be from at least 2 paragraphs. Pick up the points from these paragraphs and answer them in separate paragraphs; the "before" and "after" paragraphs. For this question lift as many words as possible from the passage, even if its a whole paragraph. Passage could be written in 1st or 3rd party view, the questions will also mention the same. When answering such questions remember to use the same character name, e.g. 作者 author or 我 I/Me or 小男孩 little boy. 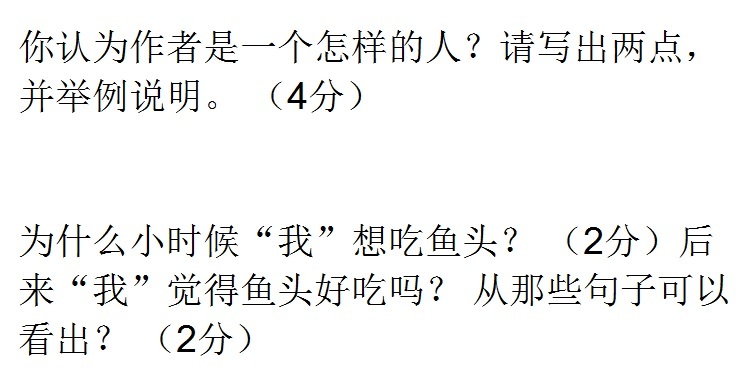 If the character is 我 I/Me, when answering question remember to put apostrophe on it - "我", such as the question example below as marks will be deducted if you did not add that to the word. 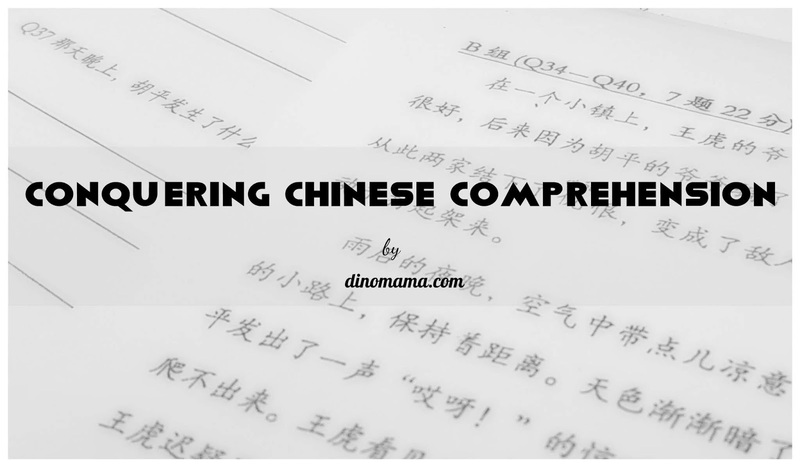 With that I have come to the end of my sharing on tips for conquering Chinese comprehension. I hope they are clear to you. If you have any questions do leave a message either at the comments section below or in my facebook page. Last but not least, as with other subjects "practice makes perfect". The tips looks easy to follow but to be able to identify the answer(s), lifting it and writing answers in logical sense needs practice too.